Thermoplastic Base No-Calk Roof Flashings Can Be Used In Commercial And Residential Applications. Thermoplastic Base No-Calk Roof Flashings create a watertight seal for when roof penetrations around the plumbing vent pipe are required. 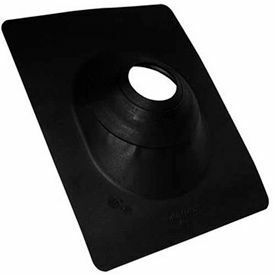 Non-fading, non-cracking, rigid black thermoplastic base provides long lasting durability. 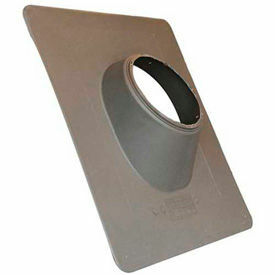 Self-sealing collar slides over pipe and requires no caulking. Plastic base for pitch from 0-45° or up to 12/12 roof. Rated 180°F continuous heat and approved for Type B installations. Available styles include Large Base No-Calk, No-Calk, and No-Calk Roof Flashing-SW Texas. Do not use petroleum based products or paint on flashing collar or plastic base. Not for hot-mopped or built-up roofs. Sold in package quantities of 6 or 12. Dimensions very per model. 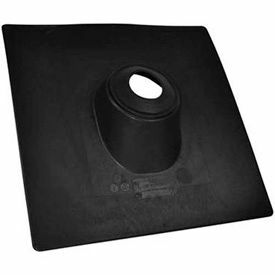 Rain Collars For No-Calk Roof Flashing Are used As A Protective Water Shield. Rain Collars For No-Calk Roof Flashing slides over existing flashing to act as a protective water shield. 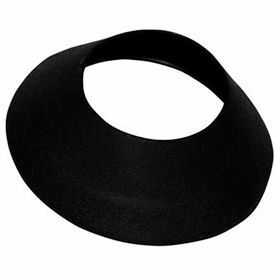 Non-fading collar material provides optimum performance. Available styles are All Flash Collar, Collar-Carded, and Rain Collar. Do not use petroleum based products on rubber collars. Dimensions and package quantities vary per model. Master Flash Roof Flashings Are Used For Profiled Roofing Syatems At Any Pitch. Master Flash Roof Flashings are easily customized to accommodate a broad range of pipe diameters and provide versatility. Rated 212°F continuous heat and approved for Type B installations. Engineered for profiled roofing systems at any pitch. Available styles are Master Flash and Retro Master Flash. Dimensions and package quantities vary per model. Flex-Flash No-Calk Roof Flashings Have100% Flexible, Foldable Plastic Base For Commercial And Residential Roofing Applications. Flex-Flash No-Calk Roof Flashings have self-sealing collars that slide over pipe and requires no caulking. Plastic base for pitch from 0-45° or up to 12/12 roof. Rated 180°F continuous heat and approved for Type B installations. Do not use petroleum based products or paint on flashing collar or plastic base. Not for hot-mopped or built-up roofs. Flex-Flash Base available in three sizes. Sold in package quantities of 12. Thermoplastic Canadian Base No-Calk Roof Flashing Are Used In Commercial And Residential Applications. 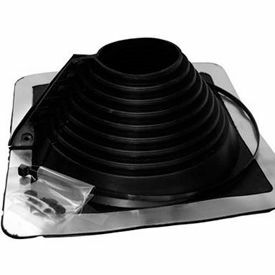 Thermoplastic Canadian Base No-Calk Roof Flashing create a watertight seal for when roof penetrations around the plumbing vent pipe are required. Roof Flashing slides over vent pipe for pitch to 45 Degrees. Non-Fading, non-cracking rigid thermoplastic base. Non-Fading sealing collar. Approved for Type B installations. Not for hot-mopped or built-up roofs. Thermoplastic Canadian Base No-Calk Roof Flashing available in Black, Brown, Grey, and Weatherwood. Dimensions vary per model. No-Calk Roof Flashings Create Watertight Seals For Roof Penetrations. No-Calk Roof Flashings are used in commercial and residential applications for creating watertight seals for when roof penetrations around plumbing vent pipe is required. Patented design allows for use on multiple pipe sizes. Galvanized, thermoplastic, copper, hard plastic or aluminum base provides long lasting durability. Rated 180°F continuous heat and approved for Type B installations. 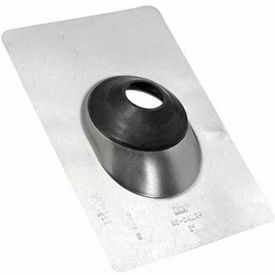 Self-sealing collar slides over pipe and requires no caulking. Not for hot-mopped or built-up roofs or petroleum based products. Available styles are All-Flash, All-Flash High-Rise No-Calk Roof Flashing, No-Flash Solar Flashings, Bent-Edge All-Flash No Calk Roof Flashing, Black flashing, ESM Flashing, Large Base No-Calk Roof Flashing, No Calk, Sideflash Vertical Flashing and more. Dimensions and package quantities vary. Color-Flash No-Calk Roof Flashings Have A Color Base Designed To Match Roof Color For Commerical And Residential Applications. Color-Flash No-Calk Roof Flashings are used to create a watertight seal when roof penetrations around the plumbing vent pipe is required. Self-sealing collar slides over pipe and requires no caulking. 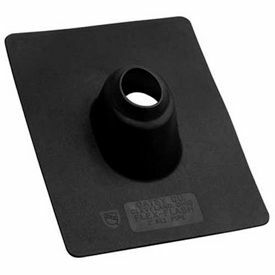 Metal base for pitch from 0-40°. Rated 180°F continuous heat and approved for Type B installations. Do not use petroleum based products or paint on flashing collar or plastic base. Not for hot-mopped or built-up roofs. Available styles include No-Calk Roof Flashings with aluminum or galvanized base. Available colors are Black, Brown or Gray. Dimensions vary per model.